Over the past few weeks there have been some interesting developments in Agriculture commodities, and Soybean Oil is no exception. Coming into the new year, Commodities were a major theme for us on the long side, specifically the Agricultural futures. These guys did great for the first quarter and the strength continued throughout the first half the second quarter. But over the past 6 weeks or so, the Grains have gotten hit pretty hard. As prices have corrected the early 2014 gains, the “Smart Money”, or Commercial Hedgers, took notice and have started to buy Corn, Wheat and Soybeans. “We also want to pay attention when they go net long a particular commodity. Because their underlying businesses are almost always naturally “long” the underlying market, they are usually selling short the futures. So when they go net long, it’s a notable event. That’s what we have in grains now. The iShares Dow Jones-UBS Grain ETF (JJG) is the most established fund that tracks these markets. It is weighted approximately 41% to corn, 34% to soybeans and 25% to wheat. We used those weights to compute a hedger index for the futures, which is what is shown above. It has just turned positive, meaning that hedgers are now net long. 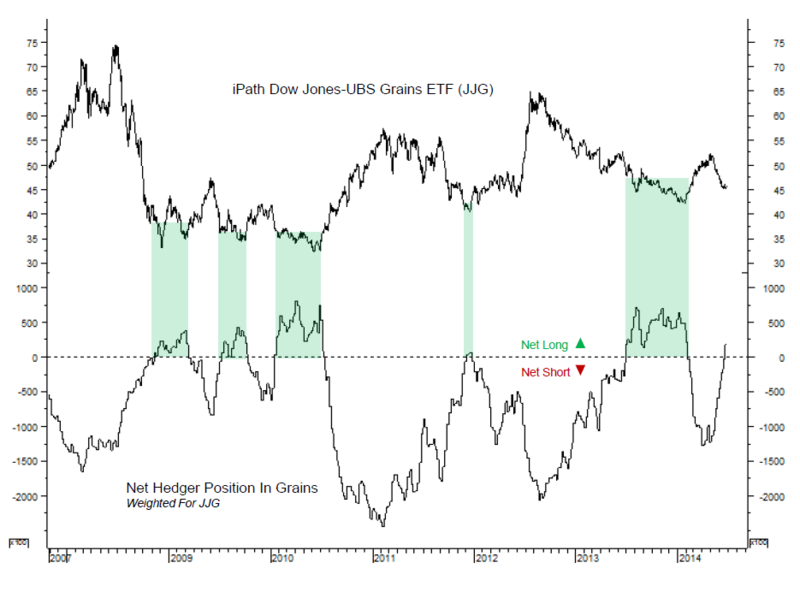 The green highlights show the other times they were net long, and we can see that each of them coincided with bottoming phases in JJG. I don’t think that just because the Commercial Hedgers are net long, we should dive in head first without any risk management strategies. But I think it’s a space that is worth looking into a little closer. The $JJG owns Corn, Beans and Wheat. If $JJC gives us a nice risk/reward entry point, then we can execute a position. How and when to enter depends on your time frame and risk parameters. For us, right now today is not that time. But I think we’re really close. REGISTER HERE for weekly updates on each of these commodity charts with comments and annotations using multiple time frames.